I’ve gotten into a bit of a rut lately with frosting. Since I discovered this white chocolate buttercream frosting, I have put it on every cake it could conceivably match. It’s delicious. A few months ago I tweaked the recipe a bit, with phenomenal results that I haven’t shared yet, in case my brother and sister-in-law host their cake contest (they have held a series of competitions with family and friends, from appetizers to chili to pie, and they keep hinting at cake…). Just in case that competition happens and I make it home for it, I want the recipe to be fresh. 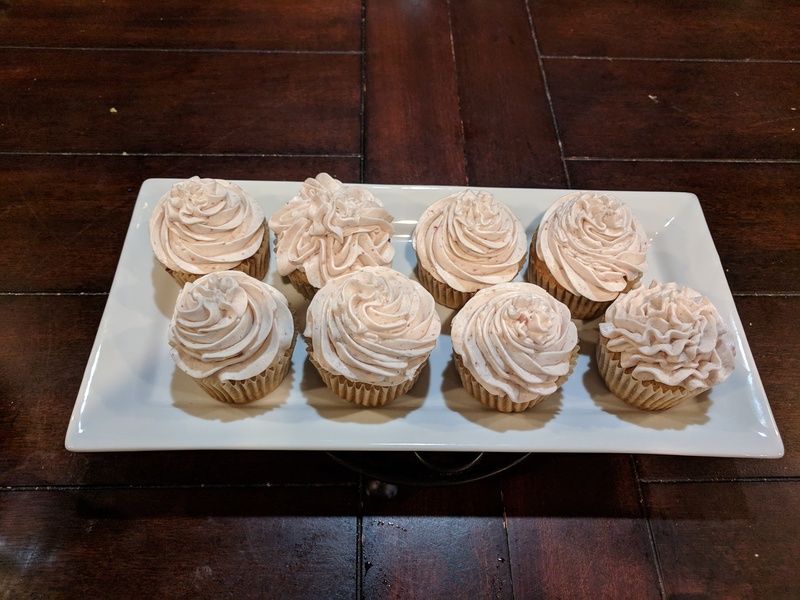 Strawberries were on sale, so I brought home a pint, prompting my 4-year-old to suggest (emphatically) that I make strawberry cupcakes. I don’t have a recipe for berry cakes, so I had to search online and came across The Recipe Rebel. I followed the cupcake recipe exactly, except they spent almost double the suggested time in the oven: over 25 minutes before the toothpick came out clean. They are good. On the dense side, but not in a bad way. My strawberries weren’t incredibly sweet, so I could have punched up the flavor a bit. Still, the story here isn’t the cupcakes, it’s the frosting. 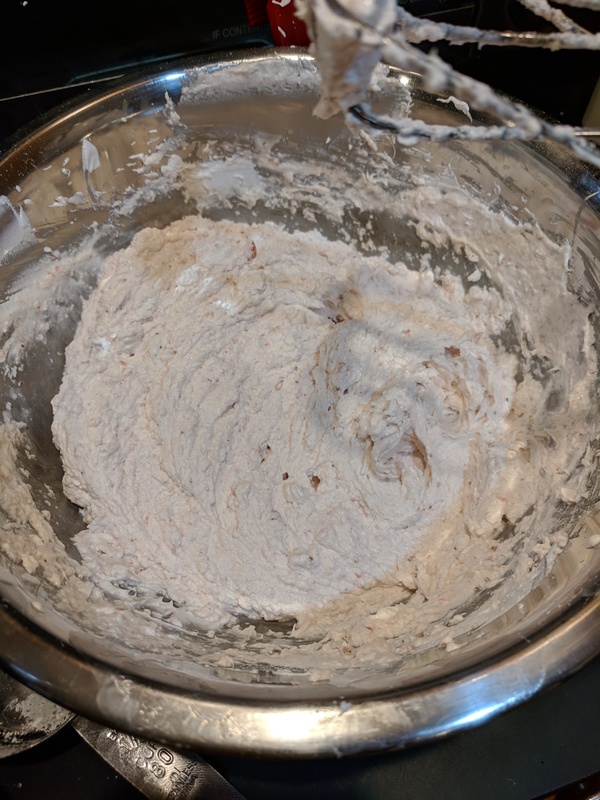 I thought I’d probably add some strawberry puree to the white chocolate frosting and call it a day, but I was reminded that the whole point of this hobby is to try new things. 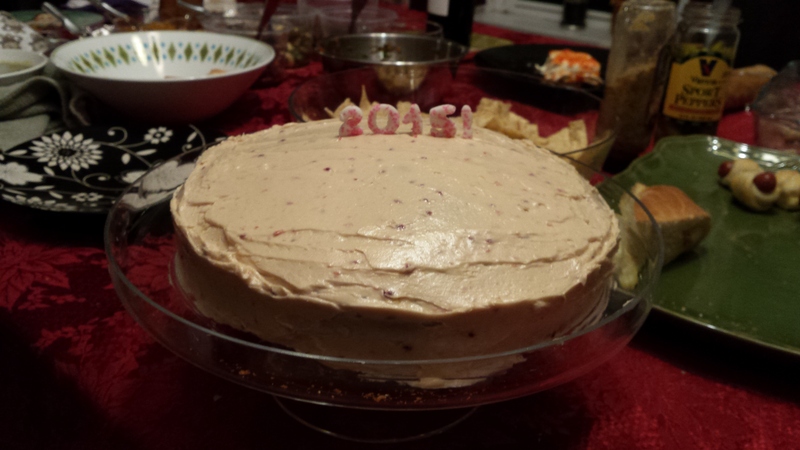 And I haven’t used eggs in frosting since the very first cake I made from the Cake Bible back on New Year’s Eve, 2015. An almond cake, I think, with raspberry buttercream from the Cake Bible and sprinkled fondant numbers. That one was plain-looking but delicious and helped inspire the original Year of Cake, so it was worth giving eggs another try. Heat sugar and egg whites in a double boiler. If you don’t have a double boiler, put 1 inch of water in a small pot and heat sugar and egg whites in a glass or metal bowl that can sit on top of the pot without touching the water. Whisk over heat until sugar is dissolved and temperature (from a candy thermometer if you have one) reaches 160 degrees, about 10 minutes. Remove from heat and beat with electric beaters until stiff peaks form, about 10 minutes. Add butter one cube at a time, beating after each addition. Beat in the strawberry puree and beat until smooth (As Recipe Rebel says: it might start to look funny and clumpy at this point — keep going! It will whip up nice and smooth. For me that took several more minutes of beating). Beat in powdered sugar to taste. I used a little over 1/3 cup, which may have been a bit much. Beat in salt, to taste. As I was working with this, I was a bit worried about the texture, which looked a bit grainy. By the end, though, it piped really nicely. I did a few variations of the classic cupcake swirl using a Wilton 1M tip.